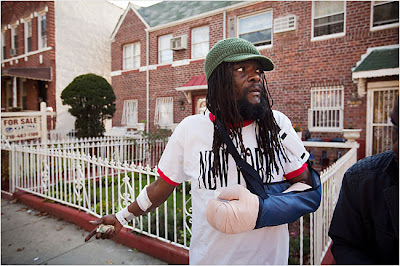 A neighbor’s wife, a large sword and a reggae singer who goes by the name Major Mackerel: Those were the ingredients of a bloody Sunday morning fight in Brooklyn, according to the police and a witness. When the fight was over, the police had arrested Oscar Joseph, 37, on charges including assault with intent to cause serious injury — in this case, to his neighbor the singer, whose real name is Garfield Dixon, 41. The police said that about 8 a.m., they were called to a two-story brick house on East 91st Street near East New York Avenue, where Mr. Dixon and Mr. Joseph live on different floors. They found Mr. Dixon “with lacerations to the head, arm and hand.” They arrested Mr. Joseph and recovered a two-foot-long sword. Mr. Dixon, who achieved notice as a dancehall reggae artist in the late 1980s and early ’90s, was taken to Kings County Hospital Center. Mr. Dixon’s companion, Novia Watson, 51, said the fight started after Mr. Dixon returned from buying cigarettes. When she went to open the door for Mr. Dixon, she saw Mr. Joseph waiting in the foyer. Mr. Joseph raised the sword, she said, and the two men started arguing and fighting over the weapon. “I was trying to take it from him myself,” Ms. Watson said. The fight spilled out onto the sidewalk, and Mr. Joseph accused Mr. Dixon of harassing his wife. When Ms. Watson returned from calling the police, Mr. Dixon was pacing on the sidewalk, blood seeping from a deep slash across the palm of his left hand. Ms. Watson said the police arrived within minutes and arrested Mr. Joseph, who continued to shout at Mr. Dixon, saying he made rude, suggestive comments to his wife. Ms. Watson said doctors stitched up Mr. Dixon’s hand and told him they might have to operate. Later Sunday afternoon, Mr. Dixon came home from the hospital, still wearing his hospital gown, a cast on his left hand and white gauze wrapped around his dreadlocks. He denied harassing Mr. Joseph’s wife. “I was singing my song, then I see him with a sword,” he said.